Cook takes us behind the scenes of his pilgrimages to Korea, “Land of the Morning Calm,” from a languorous and lengthy airplane flight to vigorous training sessions to meetings with illustrious personages like Dr. Yong Kim, president of the World Taekwondo Federation (“someone who is clearly at home in the halls of power”), in the Kukkiwon, the central training facility and world headquarters of Taekwondo, located in Kangnam, Seoul. “To complain about an instructor in Korea is unthinkable,” Cook tells us in one of the passages in which he discusses the differences in attitude between Korean and Western taekwondo students, and anticipates possible discouragements faced by the latter. 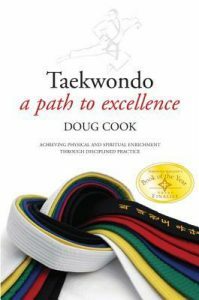 In different sections of the book, Cook touches on the importance and impact of women on taekwondo, finding that women more than pay back the increased assertiveness and self-defense skills they acquire by contributing compassion, alertness and vital strategies tailored to the needs of women who may at times face predation by male attackers. Cook highlights the importance of meditation in cleansing our minds of anxiety, vividly conjuring for us the events of September 11th, 2001 in New York, seen through the eyes of Cook and his students who wondered if class would take place that day. Likewise he stresses the need for humility over bravado, and in general champions a program of “holistic enrichment” with spiritual and ethical overtones, rather than picking up combat skills in isolation from their cultural framework. He discusses with an insider’s knowledge the disillusionment that can face a would-be dojang owner who finds that owning and operating a commercial business is not the same as practicing the martial art of taekwondo with its requisite rigorous intensity, and forthrightly addresses the tightrope that owners of martial arts studios face between (on the one hand) unseemly concupiscence and (on the other) the need to keep one’s enterprise afloat financially. In one memorable passage, Cook explains how the pursuit of martial arts may, counterintuitively, lead to greater peace. Invariably, we will ask how a pursuit so resonant with aggressive overtones can benefit humanity. The solution to this paradox can be found in the realization that the more frequently students train and become proficient in the martial arts, the more they will discover that they have less to defend against. Confidence begins to replace fear. Defense skills become internalized, resulting in the ability to walk life’s path appreciating its simple pleasures rather than being blinded by its daily perils. Doug Cook’s Tae Kwon Do: A Path to Excellence can be ordered here.